Ludo looked over the edge of the cliffs. It was indeed a long way down. Over the sound of the wind which was swirling around them he yelled “we still have a few hours of daylight; lets get across this bridge and go on for a few more miles before camping for the night. Keep away from the edge where the bridge is weakest, stay in the middle”. He carefully started walking across the bridge. With the ropes all tied together, Feldard handed one end to Ludo asthe rogue was the first to set out onto the bridge. Feldard held onto the other end, watching and waiting should the bridge fail. When it came to his turn, Feldard was more than a little hesitant. His fingers were tight on the rope as he walked hand over hand across the bridge. The only way he could manage was that he remained in the center of the bridge and could not see down on either side of him. He kept his gaze firmly on Ludo waiting on the opposite side of the bridge. Unfortunately, because of that fact he failed to notice a weak spot in the stonework. His heavy tread crumbled the weak stone beneath him opening a hole in the bridge beneath his feet. Feldard stumbled, yanking on the rope and threw himself nearer to the side in his alarm. “No!”, Stephan muttered in alarm seeing bits of the bridge fall beneath Feldard. He breathed a temporary sigh of relief when he saw the dwarf keep a good grip on the rope and make it to the other side. Next the woodsman’s turn came, he held tightly to the rope and tried to step as lightly as possible. The blustery day and strong winds on the bridge added to the anxiety. Near the center, approaching the hole formed when Feldard crossed, he paused to steel his nerves. He purposefully avoided looking down the hole as he crossed but some additional crumbling made him look out of instinct. It was dizzying scene of stone and water and…..sheer height. He quickly looked up to the sky. Wispy clouds hastened northeast. They looked like the tails of a hundred horses. This thought helped. Stephan kept his eyes up for the most part and continued across the bridge. Maruc walked forward onto the stony bridge. He tried not to look down, left, right or anywhere but at the walkway straight ahead. It wasn’t easy. The cleric clutched the rope and whispered a soft prayer the trees it was tied to would hold if the time came. The cleric knew Halav’s blessing lay deep on all the Duke’s own Traladaran land, but the thought flickered through his brain, “Ilsundal’s way with trees is deep. Would that we are favored.” Maruc wasn’t sure if that such a fleeting thought was disloyalty or prudence. But the next step demanded his attention, and so he took it carefully. And the next and the next, as the cleric made his way across the span–never once looking down, left or right; safely contained within his god-strewn reverie. Miklos helped his companions’ careful preparations as well as he could. The tough skin of the local pine roughed his hands as they drew the knots close. He felt sure the rope was strong enough. The elf watched as the mage summoned magical energies that Hasan could see and sense but could not yet control himself. Miklos expertly guided the energies–which looked as fibers of fire threading through the air to the two mages, but would be unseen by any magically insensitive–into a tapestry as complex as the talisman they carried through the watchtower. The elf then watched Miklos step onto the invisible tapestry and rise into the air. The mage moved slowly above the roadway and then, gingerly, out above the chasm below. Nothing changed. “You have grown, my friend,” Hasan called out. Miklos grinned and sped away alongside the great bridge. When the group was halfway across, loud screeching noises echoed across the mountains. Two large creatures swooped out from behind the side of the gorge, about two hundred yards away. With the head, wings and front claws of an eagle and the body and hindquarters of a lion, they were simultaneously frightening and beautiful. Miklos recognized them from his studies. Stephan and Maruc too knew of them, for they were the symbol and namesake of the elite military wing of the Church of Karameikos, the Order of the Griffon. The two griffons flew towards the bridge. Forgot to mention, Miklos had been able to identify the spells on the scroll (you can see them on the sidebar), but the wand’s power is unknown. The only way to know would be by testing it. Unknown number of charges. 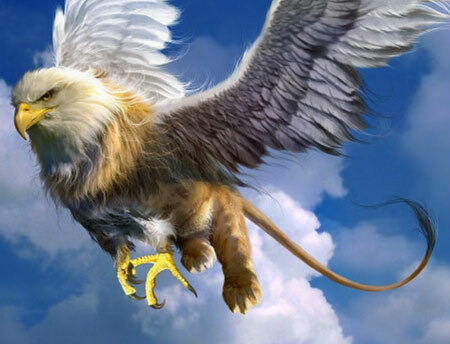 Hasan frowned as he saw the griffons speed forward. The party was seperated and weak. He stayed on the high cliff wall and watched alone. The griffons were about 200 feet away but descending to within a longbowshot. The elf laid at his feethis longbow and the most precious arrow rescued from the hall of the goblin king. The elf was ready, but pacific.